The JoJo Siwa Box is a quarterly subscription box that contains exclusive, limited edition JoJo Siwa products with a $60 + value. 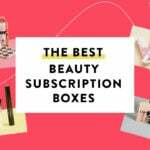 They offer a quarterly plan for $30 per quarter + shipping or an annual plan for $27 per quarter + shipping (you are billed for all 4 boxes at signup). FYI – Boxes sell out very quickly! Sign up for our The JoJo Siwa Box alerts to learn when new boxes become available. This little light is made of plastic making it very lightweight. It is also battery operated (two AAA – not included) making it very portable. The bow design is so cute and perfect for JoJo fans! The back features an on/off switch and even has holes for you to use for hanging it if you’d like. It gives off a nice subtle warm glow making it a fun option for a nightlight! This shirt is so fun with the ruffles at the bottom and the bit of sparkle on these block letters. The quality of this top is great, as is usual with their shirts, and the ruffles are actually pretty thick and full. My daughter usually wears a 6x and this comes in a 6/8 which is a tad big on her, but still wearable! It will be a great spring into summer shirt! This cute little bag could double as a clutch or a pencil case depending on the child. It features a removable strap as well as a small JoJo charm. I love the black color with all of the bright and fun designs and so did my daughter! Here is a closeup of the exterior and interior of the bag. The material is soft and seems like it would easily wipe clean as it is made from PVC. While the materials aren’t ideal, it does seem well made! This next item would make a nice accessory to clip onto our new pouch! This Bow Bow keychain is super cute and features a plush material inside making it just a bit squishy and soft to the touch. This is the second time receiving one of these collectible JoJo vinyl toys in our box. The last one came in our Fall 2018 box and my daughter loves playing with it, so she was incredibly excited to have a second one! Her favorite feature has to be the removable bow, but I loved all of the details like the somewhat realistic hair and those cute little bows on her shoes! This time our doll came attached to this small pink circle which is what helps her stand, but I noticed it was a little loose so I went ahead and took it off since I figured my daughter would prefer her legs to be a bit more realistic looking! She no longer stands up, but it’s easy enough to place the pink piece back on if we want to! The last item in the box is our collectible JoJo charm and this colorful, glittery camera is pretty cute! The camera charm makes a nice addition to our charm bracelet! Each quarterly box comes with a charm to add to the bracelet that came in the very first box which you can order separately here. New subscribers can also add the bracelet to their subscription for a discounted rate when you check out. Verdict: This season’s The JoJo Siwa Box felt a little light to me for some reason. Maybe because we only received six items instead of the usual seven? Or maybe it’s because it didn’t include one of their signature bows? My daughter and I still really liked each of the items and they were very cute and appropriate for JoJo fans! My daughter especially loves the toy and the light, while I think the shirt looks cute on her. The quality of the items is good and at $37 ($30+ $7 shipping) for this box and a total of 6 items, that gives each item an average value of about $6.17. While the average seems pretty fair, I am not quite sure that the box meets their promised value of $60, although I know that licensed merchandise does usually run a bit higher than most. It was still a box full of cute, exclusive items that my daughter loved, so I’m happy! Can you still get this box if you sign up today? Yes, as of publication the Spring box is still available. If you are interested in this box, I suggest signing up soon since these do tend to sell out quickly! Value Breakdown: This box costs $30 + $7 shipping, which means that each of the 6 items in the box has an average cost of $6.17. Check out all of our The JoJo Siwa Box reviews and the best subscription boxes for kids and tweens! So sorry about that! It was giving a weird error. Was only trying to post it once. Jojo is now doing videos and events with North West and Penelope Disck so I expect that Jojo will become alot more famous pretty soon. Jojo is doing videos with both North and Penelope of the Kardashians so her star is about to go even higher! Now that Jojo is doing videos with North West-Kim Kardashian’s daughter-her Star power will skyrocket! I too was mystified since it wasnt really the same thing like a repost but reworded statements…over a the entire day. All our comments suddenly disappeared… Fascinating. Oh, thanks! Sorry Liz! I’ve been looking up JoJo stuff, and got confused. Appreciate your patience!